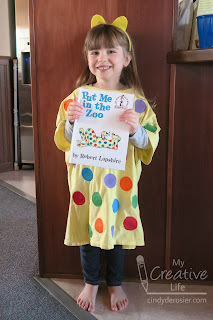 I randomly had an idea for a simple, literature-based costume for a preschooler based on Robert Lopshire's classic, "Put Me in the Zoo." Now that my niece lives out of state, I don't have any local preschoolers in my life. So I made the costume, brought it to Bandon, and hoped that Allison would model it for me. She did, though I had to snap photos very quickly. Look how cute she is! And speaking of cute, here is Trevor reading the book to my godson (my cousin Tim's son), Teagan. 1. Put newspaper in the t-shirt so that the paint does not soak through from one side to the other. 2. 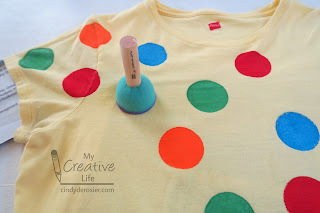 Use the spouncer to make painted circles all over the t-shirt. I did one color at a time, leaving spaces between them. 3. 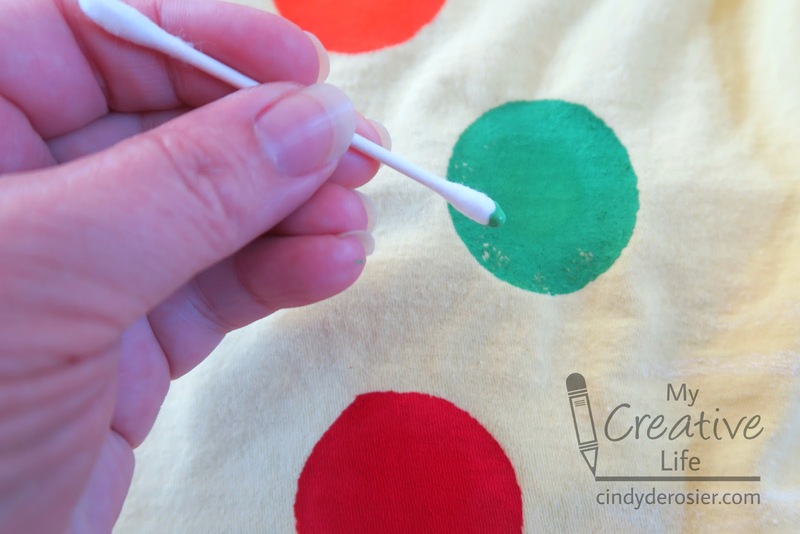 Use a q-tip to fill in any circles that are not perfect. 4. While the shirt is drying, cut ears from felt and glue them to the headband. 5. Turn the dry t-shirt over and add spots to the back. 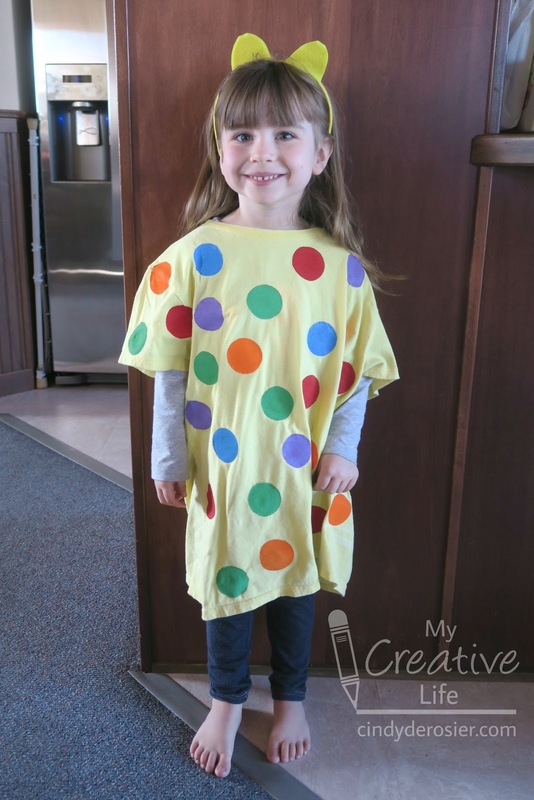 This simple costume is adorable as is, but you can add extra details if you want. Consider making a felt tail, or using facepaint to add a little black nose. So cute! 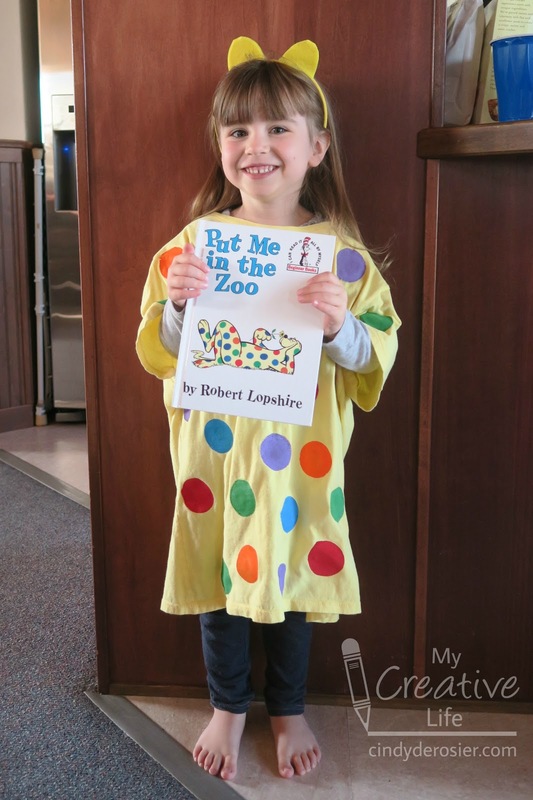 Your "Put Me in the Zoo" costume is absolutely adorable! And what a cute model you had, too. Thanks for sharing the instructions on how to make it, too. 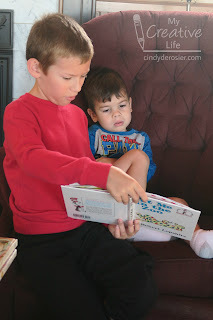 And I LOVED seeing the photo of Trevor reading to your godson! Just precious! Have a great Wednesday, Cindy!!!!! Sooooooooooooooooo cute!!!! And she looks adorable in it!!!!!!!!!!!!! Go See a Bat Flyout!